Starting in August, limited supplies of Kusui Sanso In, an original Narita International Airport (Narita, Chiba Prefecture) mineral water packed with a high concentration of oxygen, went on sale at the airport. This is the second Kusui product with the mascot named Kutan released since the original was sold in April 2008 at the airport. 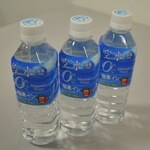 The first version, a “not cold yet delicious water,” sold well, and this new one has a higher concentration of oxygen. The water is produced by Okunagaragawa Meisui, based in Seki, Gifu Prefecture. Its source is the natural mineral water spilling from the 100 million-year-old formations in the Koka Valley of Okumi Horado. One liter holds 48 milligrams of oxygen, approximately twelve times that of tap water. Sales are being handled by Narita Airport Logistics (Narita, Chiba Prefecture), and the water is only being sold at the airport and nearby hotels. The bottles are available in the airport at twenty Kusui-only vending machines and certain stores. According to the company, the product has sold well since its release date, with average daily sales exceeding expectations at around 200 bottles. “The quality and the unique Kusui name have gotten the attention of airport visitors,” a company spokesperson said. The half-liter bottles sell for 180 yen each.